Pink Hair Dye There are 58 products. From dusty rose to pretty, pale pink to purple-like magentas, we have always been enchanted by pink shades. There’s no better color to use than a Pastel Pink Hair Dye. Follow our guide to get the best pastel pink hair. Rose Pinks. Floral and feminine shades of pastel pink. Manic Panic’s Fleurs Du Mal is so feminine you are guaranteed to always look chic and put together. Purple Pinks. Mixing purple and pink makes for a lovely magenta color. Add white and you get a very chic, dark pastel hair color dye. Salmon Pinks. If you are looking for a pink that brings out the warmer colors from the pastel shade why not try light salmon shades? Classic Pinks. For the best pastel pink hair dyes you can’t really go wrong with the classic baby pink. You can blend pastel shades with dark or fluorescent pink shades to give the color an extra pop. Many celebrities have dyed their hair pink, from Nicki Minaj to Lady Gaga, but no one does pastel pink better than these 3 pop singers. Not only does Christina Aguilera have a truly amazing set of vocals, but she has also had some very pretty soft pink hair colors. Her salmon pink dip dyes and light pink hair streaks can be easily replicated with hair chalks and paints from pastel pink hair dye brands. Manic Panic’s Pretty Flamingo shade is like a pastel version of Christina’s bold salmon pink dip dye – braid your hair once dyed to complete the look. You could even try La Riche Direction’s simple Pastel Pink shade for root to end streaks just like Christina had when she was a judge on The Voice. P!nk has proved pastel hair color dye can be very rock n’ roll. When her short hairstyle isn’t its usual platinum blond, you can bet anything that its pastel pink instead. To get the same look you’ll definitely need to bleach your hair before applying the dye. Crazy Color’s Candy Floss Pink shade and Stargazer’s Baby Pink shade are the best pastel pink hair dye for achieving P!nk’s statement look. Finish your hair with retro pin curls or gelled spikes, depending on the length. The “I Knew You Were Trouble” video marked the beginning of Taylor Swift’s move from country-style music to pure pop goodness. And of course, she did it in style. Taylor’s dip dye, pastel pink hair was both hipster and punk at the same time. Try Manic Panic’s Fuschia Shock or La Riche Directions Cerise Pink, for a purple-pink, dark, dusty and pastel-like dip dye. This is a great look for brunette’s who don’t want to bleach all their hair in one go. There’s no time to waste. Head straight to the shades below from each of these pastel pink hair dye brands to find great quality dye that’s the perfect color. Cotton Candy Pink–This amplified color is a pastel verging on vibrant. If you want a light pink color that can still pack a punch, this is the pastel pink hair dye Manic Panic shade for you. Fleurs du Mal – Translated into English this shade is called Flowers of Evil. If that won’t put a small smile on your face, the delicate pastel pink color certainly will. This is the lightest pastel pink shade from any brand. Pretty Flamingo–Vibrant yet light, this almost fluorescent shade is just like the color of flamingos. It’s a very warm, pretty tone. Candy Floss Pink – Sickly sweet and very girly. This is a classic pastel pink hair shade that’s not too light or too bright. Marshmallow Pink – Very sweet with a slight hint of mauve, this shade is similar to Fleurs du Mal but a bit darker. Rose Gold – A mellow pastel pink that’s like a mix of auburn and pink. This is a unique shade that’s almost metallic. Peachy Coral – The warmest, most golden pink that Crazy Color has to offer. While this shade is both peach and coral, it’s still undeniably pink and feminine. Pastel Pink – This is a warm, rich pastel pink color that’s like a faded version of their popular pink carnation shade. A great shade to start with if you’re a beginner at pastel pink hair dye temporary. Cerise Pink– This purple-pink shade would look lovely as dark low-lights and streaks in a lighter purple-pink pastel dye. Baby Pink - A glossy, pale pink shade that’s not quite as sweet as Crazy Color’s Candy Floss Pink. Baby pink is cute and fun. Rose Pink – For something more mature, try Stargazer’s Rose Pink shade. What you’re left with is a beautiful pastel pink with a hint of rosy-red. Pastel pink hair dye, temporary or semi-permanent, needs to be applied with care and skill. Follow these 3 steps and you can’t go wrong. Step 1: Prepare for the pastel hair dye. Use protein rich hair products, order all the mixing bowls, hair dye and accessories in advance, and don’t forget to do a test patch on your arm 48 hours beforehand. Step 2: Apply the bleach. This is necessary even with blonde hair as soft pink hair color is often very easily tinted by underlying natural colors. Follow bleach packet instructions as every brand varies. Step 3: Apply the hair dye. Follow the packet instructions and be careful how long you leave it on for. Use hair products designed for dyed hair to maintain the color for as long as possible. Now you have all the information to use pastel Pink Hair Dye at home. Here at Dye My Hair, we believe you can achieve salon-worthy results at home by simply following the right instructions and picking from one of our quality hair dyes! Peach hair dye is yet another exciting shade that has burst onto the hair color scene. It’s out with the old brown, black, red and blonde hair dyes and in with the new shades of pastels, muted tones, neon and more. The hair industry has transformed itself and is challenging brave hairdressers and clients to create hair colors and styles that are to “dye” for! 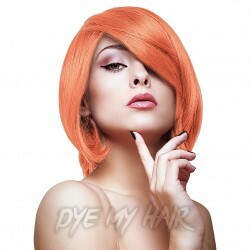 Check out our peach hair dye Manic Panic, for example; it’s the perfect blend for a light and airy summer of fun, a photo shoot or a cheeky Halloween costume. Peach hair can come in almost a rose gold peach to a bright orange peach. With creativity and a trustworthy dye, you can make it just about any shade you can think of. 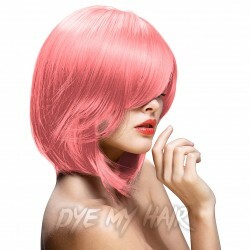 Many choose peach as it is a softer option than going for a full pink ‘do. We have plenty of dyes in our collection which make a new peach hairstyle more than achievable at home. Keep in mind, shades of peach will vary, depending on the natural color of your hair. Blondes may be able to achieve a deeper or bright peach because their hair color is more accepting of the dye. It is possible to get peach hair dye for dark hair, but you’ll need to read up on hair bleaching (don’t worry; we have a guide for that!). Now that you’ve found the peachy shade you like, which brand dye should you use? Whether you’re trying to achieve dark peach hair or peach hair ombre, we’ve got the brand for you! The top brands we love and stock, here at Dye My Hair are the highest quality dyes which produce simply awesome colors! Peach is no exception as you can try out a huge range of pastel pinks and oranges, make sure to check out all the brands below and choose the best shade for you! Also, don’t forget that the hair dyeing process can be very messy, be sure to have all of the necessary accessories on hand. For example, it is ideal to have proper hand wear such as latex or plastic gloves to protect your hands from turning peachy! Next, a dye bowl to properly mix your product is key. Dye bowls allow you to create the perfect color without clumps and lumps. This will help you to achieve even and full coverage when you apply neon peach hair dye! The final accessory you’ll need is a quality dye brush. They make dye brushes in every shape and size, so be sure to find one that will help you go for the look you’re trying to achieve. Here at Dye My Hair, we’ve got all of the dyes and accessories you’ll need to see this peach hair trend through, including bleach kits and toners. We’re basically your one-stop shop! Not only are these adorable styles perfect to show off your peach colored hair dye, but they are suitable for concerts, festivals, school, work and everyday wear. Braids will especially highlight peach dye that is paired with another dye as it creates a textured look. Experiment with a whole range of exciting colors and unique styles which are guaranteed to stand out. Because peach dyed hair is such a versatile color, it can also be highlighted or lowlighted with other colors. Consider pairing peach dye with your natural hair color. You could color the tips or even create an ombre look. Peach is a color that pairs great with blondes, brunettes and more! Peach can also be used with a pink hue or other pastel favorites to create a super subtle shade. Peach hair color accentuates many popular looks like mermaid fashion, unicorn trends, harajuku and kawaii styles and more. Because peach is so versatile it is one of our most popular collections, be sure to bag yours before it’s gone. When caring for dyed hair of any color, it is important to treat it right! For starters, you should always check what products to use for your hair type. By using the correct products, you’ll be able to wear your peach dye hair for longer! Next you’ll want to wait a few days after you have dyed your hair to wash it, usually two days is recommended. This waiting period allows your dye to set in while minimizing color bleeding. After washing your dyed hair, allow it to dry naturally and reduce the use of heat on your hair. Minimizing the use of blow dryers, straighteners and curling irons will protect your hair and keep it as healthy as possible. You should also avoid brushing your hair while wet, it can cause damage. Once you have selected your shade and brand and have picked up all your essential accessories you will be ready to use Peach Hair Dye. This fun shade is sure to become a hit this summer and we think it will be here to stay! Have you ever wanted to take the plunge with your hair and dye it a crazy, bold color? It’s normal to be nervous at first when picking such a vibrant color, but one you take the plunge, you will love it. You should embrace having a bold colored hair and know how to style it how you like, having a crazy color makes it easier to keep up with the latest trends and look your highest A-game. 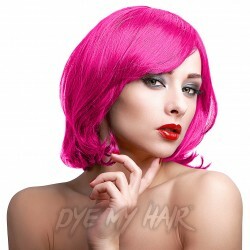 Magenta hair is extremely popular and has been growing in popularity since it first became a trend a few years ago. It’s not a natural hair color so it means that if you want to achieve the ultimate trendy hair look, you’re going to need the best magenta hair dye no matter what your original hair color is. From celebrities like Ariana Grande and Demi Lovato to Jade Twirl and many other, the younger generation of musicians and actresses has really helped to grow the popularity of pink hair by wearing it to big red-carpet events and their own concerts. Millions of women have followed their ways and joined in by dyeing their hair all different shades of beautiful magenta. Typically, magenta is a mix of red and purple shades and magenta hair dye is most often seen as a pink shade. Buying a temporary hair color will most likely result in a lighter color so your magenta is more likely to be a pink color than a darker shade. Don’t worry if you want to go for dark magenta hair as we also have plenty of dyes that will be your best friend during your hair dyeing journey. When picking your dye, you need to take a few things into consideration including your budget, the brand and its reputation, and the likelihood of the magenta hair dye taking to your natural hair color. Once you’ve done some research on everything you need to know, you’ll be ready to buy your perfect shade and box dye. We’ve created this article to advise you on the best way that you can create the ultimate magenta color hair look, whether you have naturally light hair or dark hair. After your dye is all applied you’ll need to know how to maintain it and style it, that’s pretty much what you’ll learn if you read the rest of this article. Dyeing your hair is quite universal and is similar for many colors, especially those that are a bold color. Whilst you might not need to leave the dye on for as long with a natural hair colored dye, with a color like magenta, you’ll need to make sure you take all the necessary precautions to get the color to last as long as possible and look great. If you’re looking at magenta hair dye for dark hair, then you might need to bleach your hair before you put on the magenta hair dye, otherwise if your hair is lighter then you won’t need to use bleach. The lighter your hair is, the better the magenta color hair will come out. Set everything up, make sure you have a towel and enough hair dye for all your hair. 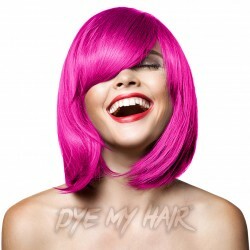 Magenta hair dye UK is available, so you should have enough to cover your hair all-over. Once you’ve mixed the box dye together then you can get started and section your hair into 4 parts. Use plastic clips to secure in place to the top of your head and start at the bottom of your head. Use the gloves provided in the hair dye and brush through the color from the roots, make sure the hair is covered with plenty of dye. Leave it on for the specified time; normally this is between 45 minutes and 1 hour. Then rinse out with warm water, keep the water running until the water runs clear and then you can wash your hair if you wish. Magenta hair looks amazing when it’s styled and there are a few particularly nice styles that look even better when you’ve got a crazy hair color like magenta. Style with curls or straighten it for different looks and occasions. A classic, trendy style is putting half up in a bun and leaving the rest curly and to flow down. You can even mix it up a little bit and put a braid in your hair too; they look classy and can change any look from casual to up-beat and party ready! If you’ve decided to go for a temporary hair color such as magenta, then you need to make the most of your hair color while it lasts. You can do this with some crazy styles. Leaving your hair down with a magenta color will also have a great effect; it’s easy to live with and will look good on Instagram. So what more would you want? For those beauties that go for dark magenta hair, it will look its best in the winter. The lighter colors will look really great in the summertime. To be honest though, whatever the weather or season, you should be able to rock the magenta hair look. Whether you want to accomplish a fresh mermaid look or new ombré style, hot pink hair dye is the way to go! You find the style and we will help you find the pink hair dye brands that you will want and need! Continue reading to find out more about the dye process, let’s get started. Step One: Before jumping right in and just mindlessly making a hair dye purchase, we want you to consider your options. 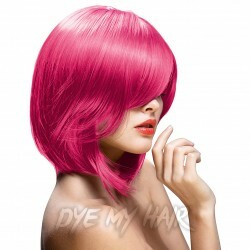 For example, do you want utilize pink semi permanent hair dye or temporary pink hair dye? Each type of dye has its advantages; with pink hair dye temporary, you can apply it, go to your event and then wash it out whenever you wish. It’s easy peasy and affordable too! With a semi-permanent dye, you could choose to leave the new color in for as little or as long as you’d like by minimizing the amount of times you shampoo it. On most occasions, semi-permanent dyes can last for 4-12 shampoos. Step Two: Choose which brand works best for you. We have the best brands in the business, including but not limited to Crazy Color, Herman’s Amazing, La Riche Directions, Manic Panic, Splat, Stargazer and Paintglow. Be sure to check out the Manic Panic Hot Hot Pink, it’s one of our best sellers! We know the decision between brands can be quite difficult. We highly recommend researching each brand to ensure that they possess all of the qualities you need and desire from a hair dye brands. Our very diverse clientele have very diverse preferences and we understand that; which is why we hope you can see why we have such a great selection. We really enjoy catering to a variety of hair dyeing needs. Step Three: Find Your perfect color. Neon pink hair dye, hot pink or light pink, which color works best for you? Pretty Flamingo and Cotton Candy Pink are just a few of our favorite hues. We would also highly recommend Marshmallow Pink, Pink Carnation and Berry Blasts as just a few more of our go-to colors. It’s quite overwhelming isn’t it? We suggest searching through the pink dye section on our website and using the old fashioned eye-test to see which shade is the one you want. Whichever looks appealing to you is best. Protective gloves are a must when it comes to hair dye, they will keep you clean and safe as you mix your next look. As you mix, consider utilizing a heavy duty hair color mixing bowl. These bowls are reusable and made to mix dye. This way, you won’t have to throw away your fancy dinnerware or Tupperware any longer. To apply dye, use our professional brushes. Each brush was designed with you and your tastes in mind, making it easy for you to apply it as you envisioned, the first time. No more having to re-dye hair because it was accidently messed up in the process. Lastly, grab the professional shampoos, conditioners, serums and hair sprays for aftercare. Starting the hair dye process without being prepared is a no-no. Make sure you have everything you need or you’ll get stuck in the middle of your new hair-do and unable to run out for more. If none of these looks are appealing to your tastes, simply dye your hair a solid pink color and style it with a more traditional look. After all, it’s okay to just straighten your new Cerise pink locks or give your pastel pink hair-do a curl because simplicity is beautiful too! Your new style choices will look excellent in a sultry photo shoot, at a birthday party, for your Halloween costume or to complete your Princess Bubblegum look at Comic Con. With so much potential it’s no wonder pink hair dye is such a hot commodity! If you’re in need of more inspiration, check major sites like Pinterest to see what works best for you. You’ll find that A list celebrities everywhere are taking the pink plunge (think: model Bella Thorne, singer Pink and actress Drew Barrymore to name a few). Our trusty blog also shares inspiration regularly; so check it out and steal a few creative ideas for your own style book. Get Your New Pink Dye Today! Say goodbye to bland dyes and hello to the best hot pink hair dye on the market. Dye My Hair will always provide you with top of the line products like pink hair dye manic panic and other vivacious PPD free dye colors that will leave you wanting more. So tell us, which of our amazing brands will be your next go-to hair dye? For a style that’ll make you stand out from the crowd, a fresh raspberry pink hair color is a great choice. No matter what your style is, there will be a raspberry pink look that’ll be amazing on you! One of the best things about using raspberry pink hair dye is that it’s relatively low maintenance. We’ve all seen how popular pastel hair colors have become but, anyone who has experimented with them will tell you how difficult these shades are to achieve and attain. A deeper pink hair dye color like raspberry pink is a much simpler alternative. It packs all the punch of pastels without the fuss. If you want to turn heads with a glossy rich new color, then raspberry pink should be your new hue. One of the beauties of raspberry pink hair dye is that it can be used in lots of different ways. There’s sure to be a raspberry pink hair color that’ll suit you. From frosted raspberry highlights to a full on raspberry ripple style, this super sweet hair color is always versatile and fun. Raspberry rose gold: Rose gold is a firm style favorite that we’ve been crushing on for years. Luckily, we don’t need to keep buying watches and jewellery to get our fix anymore. Rose gold is everywhere nowadays and it’s even becoming a popular hair color. This gorgeous blend of shimmering gold, pink and coral tones is perfect for blondies looking for a subtle style update. A rose pink temp hair dye is a fun way to experiment with this cool, modern look. Deep raspberry: An all-over deep raspberry pink hair color is a brighter and bolder step up from burgundy or wine. This warm, colorful look gives hair a radiant shine and is perfect for an Autumn or Winter hair change. If you’ve got dark hair and want to go pink, it’s easy to get a deep raspberry pink hair color without needing to bleach your hair first. The queen of colorful hair, Katy Perry looked amazing with her retro raspberry pink 'do. Deep raspberry/ pastel pink ombre: Can’t decide between deep rich shades and pretty pastel tones? You don’t need to anymore with this clever ombre. By graduating between deep raspberry pink at the top and candy floss pink at the bottom, you can enjoy the best of both worlds. Chocolate & raspberry balayage: Balayage is a hair dyeing technique that offers a subtler version of the popular ombre. By brushing the color on to the ends of your hair, you’ll be able to dip your toes into the pink hair trend. Preparation: Healthy shiny hair always takes color more easily than limp, damaged hair. Before going pink, start deep conditioning your hair once or twice a week. This will allow the color to penetrate every strand of hair and look even more beautiful. Bleaching: If you want to go for a rose gold hue or super bright tones, it’s best to pre-bleach your hair first. Start with a darker shade: Since raspberry pink hair dye will, inevitably, fade over time, it’s best to start with a color a few shades darker than what you were hoping for. After a few washes, you’ll get to the exact color you want. One of the biggest problems with vibrant, colorful hair is its longevity. Sadly, those bright pink hues don’t last forever but there are some tips you can follow to keep it looking sweet and rosy for even longer. Use a sulfate free shampoo: Mainstream shampoos, packed full of sulfates, are the ultimate enemy for gorgeous, brightly colored hair. If you want to keep your color fresher for longer, choose a color preserving shampoo. Freshen your hair with dry shampoo instead: Dry shampoo is a great way to freshen up your hair in between washes and it will give you more volume, too. Rinse your hair with cool water: Whenever you wash your hair with hot water, it opens up the cuticles, allowing the color to spill out. Washing your hair with cold water locks the cuticle meaning you can keep your gorgeous color for longer. Use a heat protector spray: Now that you’ve got stunning pink locks, you probably want to try out a whole load of hairstyles. Just make sure to protect your hair with a heatproof spray since it needs lots of love and attention after dyeing. Pink hair, no matter the tone, needs to be well looked after. The aftercare is just as important as the dye job itself. With just a little bit of TLC, you’ll have bright, bold beautiful hair for even longer! If you’re ready to jump on board and join all the pink haired goddesses out there, then take a look at our huge range of hair dyes. There’s no better time than now for a change and no prettier color than this beautiful raspberry pink hair dye. Choose your favorite style and rock your pink hair like you just don’t care! Thinking about getting a new style? Well, with the La Riche Directions Semi-Permanent Hair Dye in Flamingo Pink you can achieve the look you've been craving. If you want a hair color that's sweeter than candy, check out the Crazy Color Semi-Permanent Hair Dye 4 Pack in Candy Floss Pink! Get a great hair color that will make you stand out from the crowd. 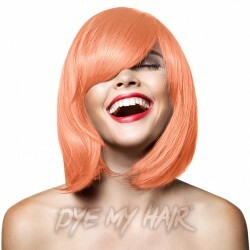 Get the pastel pink colour of the Crazy Color Semi-Permanent Hair Dye 100ml in Peachy Coral. 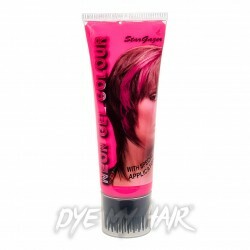 Rock a full glowing pink 'do with this shade of Stargazer UV Hair Gel 50ml in Pink! It's certain to make you stand out from the crowd! Grab the Manic Panic Amplified Semi-Permanent Hair Dye in Hot Hot Pink for a hot hot look! Pink, pretty and extremely vibrant, this Crazy Color Semi-Permanent Hair Dye in Pinkissimo is sure to give you the stand out style you’ve been looking for! Add a splash of peachy splendour to your tresses with the super on-trend Herman's Amazing Semi-Permanent Hair Color in Rosie Gold! Transform your look before and after dark with the Stargazer Semi-Permanent Hair Dye in UV Pink! Looking to turn heads with a fresh head of funky colored hair? Then check out the Manic Panic Creamtones Perfect Pastel Hair Dye in Dreamsicle! If you want to make an impression, go pink! The La Riche Directions Semi-Permanent Hair Dye in Pastel Pink is a must-have!